The first day of the BMW Championship at Conway Farms in Lake Forest provided plenty of intrigue for both fans in attendance, as well as those watching on TV. For starters, there was Brandt Snedeker's birdie run that helped him to card an eight-under par 63 on the day. Zach Johnson didn't let him get too far ahead of the field, however, firing a 64 of his own. Even stars like Tiger Woods and Adam Scott got into the act, shooting a 66 and 67, respectively. Now, with the second round getting underway (Golf Channel picks up their coverage at 2pm Central for those looking to watch on TV), here are three storylines to keep an eye on as the players begin their attempts to catch up with Snedeker. 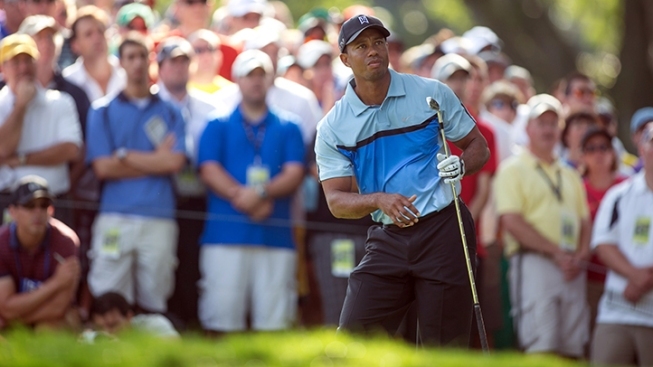 Will Tiger Woods' back hold up? One of the biggest stories that came out of the Deutsche Bank Championship two weeks ago was the health concerns of Tiger Woods. He repeatedly grimaced in pain during that tournament, and ended up finishing near the bottom of the field. His back didn't look like it was much of an issue for him on Thursday, however, as he ended up in a tie for 3rd place after 18 holes. He will tee off around noon Central time, meaning that he will be hitting the back nine when Golf Channel picks up their coverage. Snedeker's thrilling run to the championship last year captivated golf fans, but according to the history of the FedEx Cup playoffs, this year should be much more disappointing. That's because no Cup winner has ever even made it to the Tour Championship the following year. Whether it's due to an injury (Woods) or poor play (Vijay Singh), players just can't seem to get through the grind of the playoffs in consecutive seasons, but Snedeker is poised to do just that after his first round 63. Making things even more remarkable for him is how well he is playing with distractions going on back home. His mother underwent surgery during the off-week in the schedule, and Snedeker spent four days at her bedside in Alabama. Fortunately for both, she is feeling better, and Snedeker is undoubtedly giving her a reason to smile with his play so far this week. Speaking of golfers playing through personal issues, there was speculation early in the week that Phil Mickelson wouldn't even be making the trip to Chicago, as he was dealing with family issues back home in California. He missed the pro-am tournament on Wednesday, but he came out on Thursday and performed about as well as could be expected under the circumstances. Having never seen the course before, Mickelson still managed to shoot a 1-under par 70 for the day, and positioned himself well to make a move as we head towards the weekend.